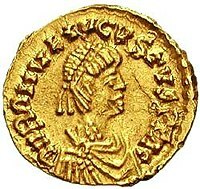 Romulus Augustus (born perhaps aroond 461 – died efter 476, an wis apparently still alive as late as 507) was an Emperor (alleged usurper) reignin ower the Wastren Roman Empire frae 31 October 475 till 4 September 476. ↑ Nepos maintained a claim tae the poseetion till he wis murthert in 480. This page wis last eeditit on 3 October 2015, at 13:54.